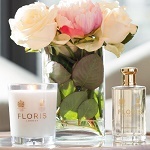 Fragile peonies evokes a sense of early Spring reverie and fond memories, as they intertwine with the opulence of rose, violet leaves and ivy, while green tea, cinnamon and clove add depth and a hint of spice to create warmth in the heart. Iris and musk gives this scent its distinctive character. This rose and peony led fragrance celebrates femininity, conjuring modern apartments with rich dashes of luxury and poise.